The term superfood is pretty much a marketing gimmick to get you to buy into a particular product being more ‘healthy’ than the next. But that aside, the nutrient density of foods is something not to be ignored. Whilst it doesn’t top calories and macros from a pure weight and fat loss perspective, it is important. Whole foods offer a ton of added benefits for your overall health and general well-being. And packing in those micronutrients is going to make you feel and function better on a day to day basis. Buckwheat is one of those ingredients that gives you a lot of bang for your buck from a nutrient standpoint. So let’s see what it’s packing. And on top of that you’ll be getting some essential vitamins and minerals as well as those macros and fibre. Iron (12%), Magnesium (57%), Potassium (13%), Vitamin B6 (10%) are all in there to name but a few. Digestible Protein – For a plant-based ingredient, buckwheat has a high amount of protein compared to other grains. In fact, in terms of protein it out-muscles rice and wheat. And if you’re a vegetarian or vegan then buckwheat provides you with both lysine and arginine. These are amino acids you generally won’t find in other common grains and cereals. Therefore, it’s going to help you get a fully rounded diet. High Fibre – Buckwheat is packed with plenty of fibre to keep you regular. And that’s a very under-rated thing. Because gut health is such important thing for keeping your whole body running smoothly. And with the proliferation of If It Fits Your Macros Instagrammers popularising pizza and ice cream diets, fibre and gut health is being neglected. Gluten Free – For those of you out there with a genuine gluten intolerance, buckwheat is a God-send. And I mean real gluten intolerance sufferers here. Not you’re hipster, ‘gluten-free is cool’ types. Buckwheat is actually a seed and not a grain. And it’s suitable for anyone with celiac disease or gluten sensitivity. So if you suffer from or have the symptoms of gluten intolerance, then give buckwheat a try. Sustainable Energy – Buckwheat is low on the Glycemic Index. That means that the energy is release slowly into the bloodstream, helping you feel fuller for longer. That helps control your hunger as well as blood sugar levels. So now we know buckwheat is highly beneficial for your health, it’s time to see how tasty it can really be! Next, zest the whole lemon and set aside half for the topping. Mash the banana in a bowl and add in the chia seeds, flour, milk, cardamom, vanilla, half the lemon zest and 1 tsp. honey. Whisk everything well until a thick batter has formed. Heat some of the coconut oil in a non-stick pan then pour the batter forming small pancakes (about ¼ cup per pancake). Fry until bubbles appear on the surface and then flip and cook for another minute. Repeat with the rest of the batter adding more coconut oil when required. You should be able to make about 6 small pancakes. Finally, Combine 3 tsp. of honey and the rest of the lemon zest to make the drizzle. Firstly, pre-heat oven to (390F) 200C. Mash the peeled bananas with a fork and mix well with the melted coconut oil and honey. Add in the flour, baking powder and cinnamon, mix well. And then add in the pecans and mix again. Bake in a greased and lined 2lb loaf tin for 20 mins, then cover with foil if the loaf is browning. Cook for another 30-40 mins. Finally, allow to cool before slicing. So there you have it. 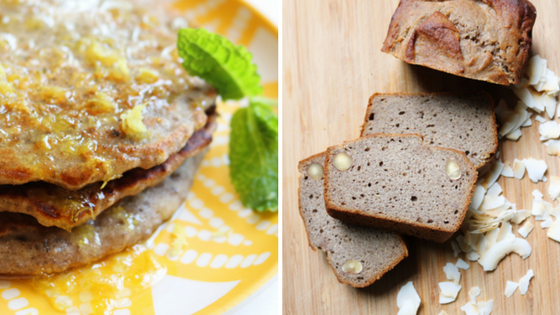 Buckwheat recipes that will have you coming back for more, time and time again! Enjoy eating them and enjoy the health benefits that come with them too.